Heat a griddle, large frypan or BBQ plate to hot. Brush your eggplant slices both sides with olive oil and grill over high heat, around 30 seconds each side, or until the flesh is browning and softening a little. Remove to a plate and continue until all the eggplant is cooked. Heat olive oil in a large frying pan or heavy based pot and add the onion. Cook onion stirring for 5 minutes before adding the garlic and carrot. Continue cooking for a further few minutes until the garlic is fragrant. Add the remaining ingredients, stir well to combine and bring to the boil before lowering to a simmer and cooking with a lid on for 10-15 minutes. Season to taste. In a large saucepan, melt butter over medium-low heat and gradually whisk in flour. Cook for 2 minutes, stirring constantly. Add scalding milk and whisk rapidly to combine. Bring to a slow boil, whisking constantly. Reduce heat and simmer for 5 minutes, stirring frequently, until smooth and thickened. Season with salt, white pepper and nutmeg. Let cool slightly. In a mixing bowl, beat eggs and whisk in a spoonful of white sauce. Whisk in remaining white sauce in a thin stream, and adjust seasoning. Add ½ cup of pecorino and stir until smooth and melted through. Spread ½ a cup of lentil sauce across the base of the baking dish. Then, spread a tightly packed layer of eggplant across the base of the dish and lightly season. Follow with a tightly packed layer of potatoes. Sprinkle with pecorino. Top with half the lentil mix. Top the dish with your white sauce and any remaining cheese. Bake for 45-50 minutes until the top is browned and the potatoes are fork tender. Cool for 10-15 minutes before serving as the dish will be easier to portion and handle. 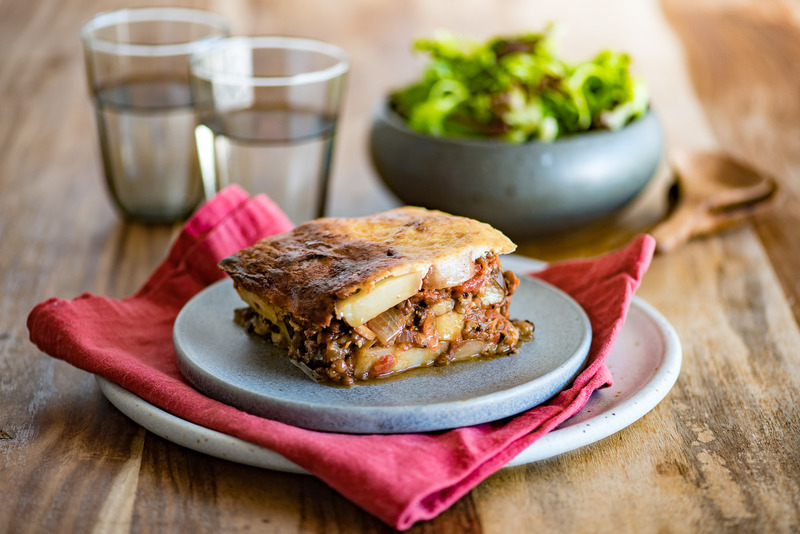 TIP: You could play with making your Moussaka more layers if you have a smaller, deeper dish. This can also be made in multiple miniatures if you have individual ramekins.